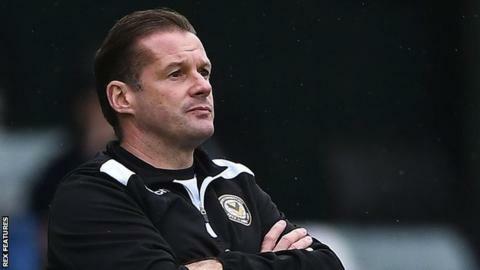 Newport County boss Graham Westley says his side are making big improvements on the pitch with every game they play. The Exiles recovered from going 2-1 down to Barnet in the 85th minute and equalised with just a minute of normal time left to rescue a point. "Our early season form wasn't showing that many chances, but we're looking like a unit going forward," he said. "There's a sense of purpose to us and anyone watching us would be excited by the play." Despite rallying to a late point, Westley's side remain bottom of the League Two table and are winless in their last 13 games in all competitions. "The whole process we're going through is reducing the errors and improving our defensive organisation," Westley told BBC Radio Wales. "I'm improving our work rate throughout and making sure we've got a pattern to our play and that we're allowing the players to express themselves." Newport County travel to Accrington on Saturday and a win against Stanley will give Westley's side hope of reducing the five-point deficit they have at the bottom of the table. "We need to start posting the points to move up the league but we're not going to start panicking about the fact that we are where we are," he continued. "We need to keep pushing the improvement buttons and if we keep improving we'll start winning the three points and start climbing up the league."